[mrgreen]It is not always the case, but every once in a while an online game becomes so popular that a sequel is developed to keep the enthused fans happy. 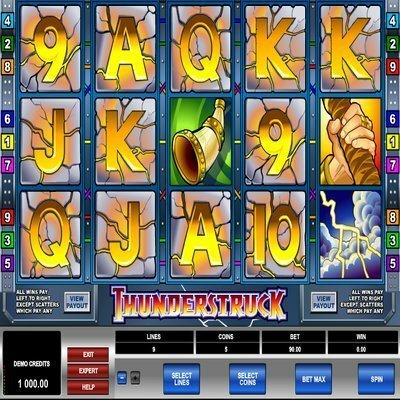 Such is the case with the wildly successful online video slot machine, Thunderstruck. Just recently released, Thunderstruck II claims to be every bit as good as the original. Does part II live up to the success of the first part? We will have to take an up close and personal look at the inner workings of this slot machine to properly measure its potential. Like with this first installment of Thunderstruck, players in part II get to assume the mantle of Thor, God of Thunder, as they battle it out with vicious warriors with the help of other gods, such as Loki the God of Mischief and Odin, the Ruler of Asgard. Of course, this has a very Marvel-like feel about it, and that’s perhaps the biggest reason that people love playing. But beyond simply getting to see the characters, Thunderstruck II actually presents a cool storyline, plenty of cut scenes, and other features that make players feel as if they are immersed in the fantasy world. Of course, the best theme in the world doesn’t replace a good game. So, in terms of slot machine functionality, what does Thunderstruck II offer up? First and foremost, there are plenty of wilds, expanding wilds, scatters, and even four separate ways to hit the free spins feature. There are also free games and multipliers that range from 2 to 6x the wager or win. The first thing that really strikes people as cool is the Wildstorm feature. Midway through a spin, if you hit the Wildstorm you will hear the clap of thunder and earn a free spin and five expanding wild reels. You can also unlock plenty of other bonuses throughout the game, such as The Great Hall of Free Spins, which is activated when you hit 3, 4 or 5 Hammer symbols, and you subsequently get to spin to unlock chambers. There’s also the Valkyrie’s Free Spin Bonus, the Loki and Odin Free Spin bonus features, and the Thor Free Spin bonus, which is the most lucrative of them all. Thunderstruck II is fairly unique when it comes to its betting structure. There are no set paylines per se; instead, players have a whopping 243 different ways to win. This does limit the overall betting options, as in betting on specific or multiple lines, but it also greatly increases a player’s odds of hitting some type of bonus feature or a win. And with Thunderstruck II, there are plenty of bonuses to be had. It is not inconceivable that you will earn more free spins than spins you paid for. The most compelling bit about Thunderstruck II is its very cool theme and interactive format. Other than that, though, it continues to score big points by offering up a wide range of bonuses, wilds, scatters, and plenty of ways to win big money.